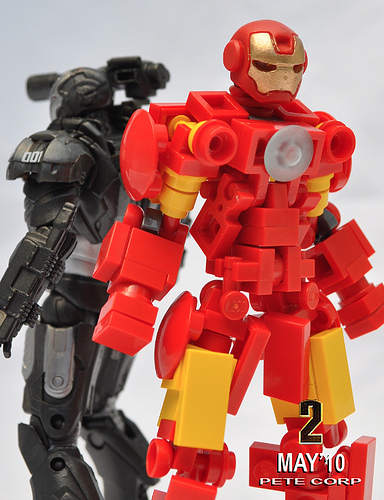 I just watched Iron Man 2 this weekend, and I’m happy to see that Peter C. has captured the awesomeness of Iron Man in an action figure sized build. The head is a custom Lego-compatible piece from Hazel’s Amazing Armory, the core is a Clickits icon. Actually, I believe the head is a custom minifig helmet from Hazel’s Amazing Armory. Very nice design! As polywen said, the helmet is a custom LEGO gadget, on sale via eBay. The pic with firing hand position is simply awesome, in wich he used a minifig swimfin. 97 pieces for Iron Man including helmet. That proportion is great. Makes for really dynamic poses.